Welcome to San Pasqual High School's Parent Club. We invite you to attend our meetings and get involved. 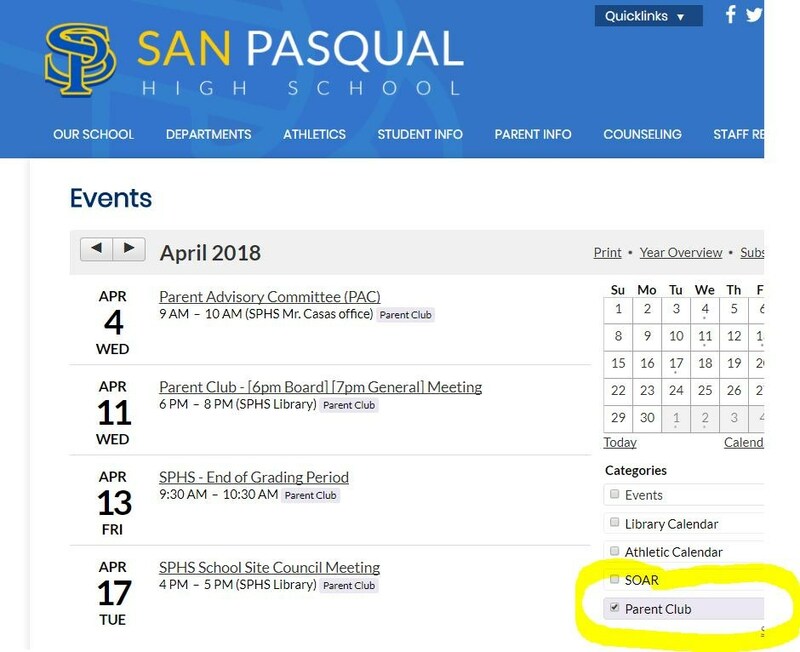 If you aren't getting our e-mail updates, please send us an email at sanpasqualhighschoolparentclub@gmail.com and we will get you on the mailing list. Eagles Nest is an after school snack bar that is run through SPHS Parent Club. We provide a variety of snacks and beverages at minimal charge for those students that stay on campus after the school day ends Monday - Friday. The Nest is staffed by parent volunteers, but we have room for student volunteers also. Students can earn community service hours for their participation in the program. Contact us at sanpasqualhighschoolparentclub@gmail.com if you are interested in helping our or have a student that would like to earn community service hours. The application for the National School Lunch Program (NSLP) may determine not only if your student will receive breakfast and lunch at a great savings to you, but whether or not your student will also recieve savings related to college intrance test fees, Advanced Placement exam fees and college application fees. Please click here for more detailed information! Haga clic aquí para obtener información más detallada! In order to help keep our schools safe the North Country Office of Education along with Escondido High School District has created the following document to help parents identify warning signals of mental illness in young adults. Being able to identify students in need can help keep our schools safe and also help students receive the services that they need. The documents are available both in English and Spanish below.